Community Outreach Programme (CORP) is an initiative of the Methodist Church in India. CORP engages itself with diverse groups within the community: it provides education, guidance and shelter homes to vulnerable children and young adults; conducts empowerment programmes for disadvantaged women; sponsors meals for abandoned senior citizens; and offers counseling plus non-formal education to differently abled individuals. CORP’s credo is to raise the standard of living of people living in the slums of Mumbai. CORP was among the few proactive non-profits in Mumbai set up way back in 1977 to nurture and build self-confidence among the underprivileged communities so that they could become active contributors to India’s growth rather than depend on others in today’s globalized and competitive era. Since 1978, CORP has been receiving unstinted support from the Central & State Government to implement various programmes. Several institutional funders also came forward to support CORP’s mission. CORP is among the highly respected, well-known, and professionally run non-profits in Mumbai. CORP reaches out to 25,000 to 30,000 beneficiaries annually through multiple projects across the slums in Mumbai. CORP supported 85 children in FY13 v/s 75 in FY12 across three shelter homes and crèches. During FY13, two vocational training centers were started for women providing courses on tailoring, beautician training and computer literacy. Roughly 500 women had enrolled across different courses in FY13. About 80% of women who completed the tailoring course received employment in the garment industry. Others are operating from home and contributing to their family income. CORP’s family counselling center managed to resolve 150 disputes during FY13, many of which involved women who were victims of domestic violence. Hearing Aids, Callipers, Wheelchairs and other materials were distributed to 200 differently abled individuals in FY13 to help them cope with their disabilities. CORP’s total income increased Y-o-Y by 40% to Rs15.9mn in FY13 owing to significant Y-o-Y increase (1.7x to Rs11.71mn in FY13) in donations received from foreign sources. While government support continues, CORP’s growth over the years has reduced the share of income from government grants to only 13% & 7% of total income in FY12 and FY13 respectively. This was allocated to meet operating expenses for the crèches and family counseling centers (Refer fig. 1). 83% of total expenses in FY13 was spent directly on beneficiaries (52% on programs, 30% on salaries and 1% on travel). The average spend on beneficiaries in last 4 years has been 80% (Refer fig. 2). Total spend on beneficiaries increased from 76% in FY12 to 83% in FY13. The rise can be attributed to introduction of skill training programs for women and meal program for senior citizens. CORP has demonstrated a reasonable Y-o-Y income growth since FY10; confirming the team’s continuous efforts to raise funds from donors. 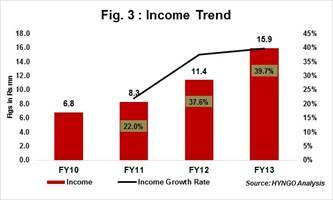 4-Year total income CAGR stood at 33% during FY10 – FY13. 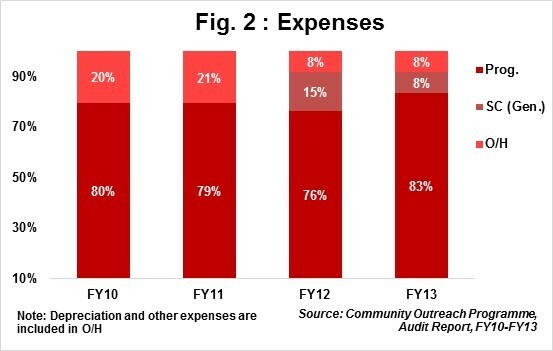 Self Sufficiency Ratio (SSR) which indicates organisation’s ability to meet its operating expenses from its own income (service charges, interest income, and individual donations) stood at 20% for FY13 viz-a-viz 36% in FY12. Low SSR in this case is only to be expected, because CORP renders free services to all its beneficiaries. 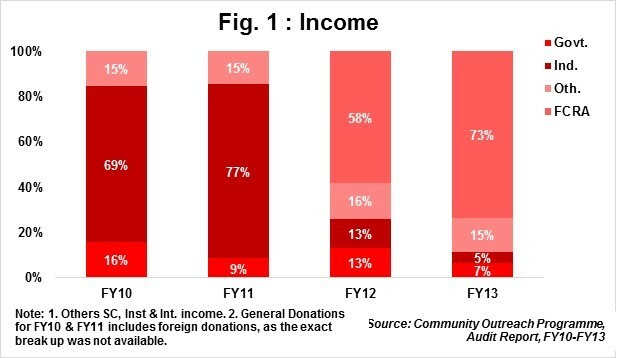 About 53% of total donations received during FY13 were raised from long term committed donors i.e. recurring donors and the balance 47% was raised from new donors. Recurring donors include not only institutions but also individual philanthropists. The healthy mix of recurring and one time donors indicates CORP’s consistent delivery of excellent performance in the community as well as reaffirms CORP’s longevity. This NGO is one of the very few which currently do not face major challenges relating to income generation, team size and space constraints. In rare cases, they do find it difficult to convince parents to send children to their centers for non-formal education. Consider ways to generate own income; thus making CORP self-sustained. CORP comes across as a well-governed and professionally run. Board consists of twelve members. Board meetings are held at the end of each quarter. Quorum set for board meetings is ten. It is mandatory for each Board member to attend atleast three Board meetings in a year. Members traveling during the meeting date, are required to participate via skype / video conference facility. Besides Board Meetings, CORP’s staff meets quarterly, core team (incl. management and senior executives) meet once a month, field/social workers are required to meet once a week. Meetings are mandatory for all. The annual reports, in-house newsletters and other leaflets are detailed, well-structured and comprehensive. These documents are circulated to all donors regularly. During FY13, CORP got listed with Credibility Alliance (Desirable Norms) and Give India.